Elon Musk has finally done it, after an exhausting sever-year long delay. 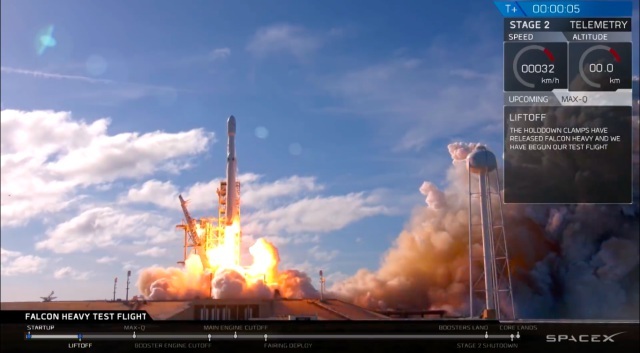 SpaceX’s Falcon Heavy today took flight from launchpad 39A at the Kennedy Space Center in Florida. 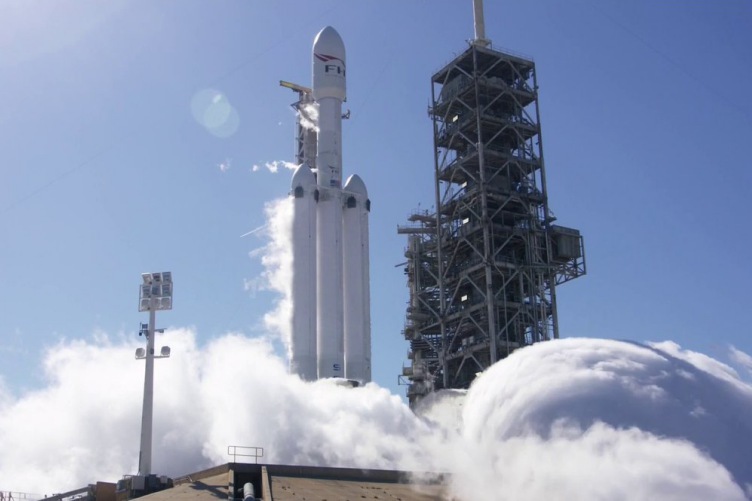 This was the maiden flight of the Falcon Heavy and the mission has been (let us say, mostly!) successful. But, the only question that you possibly want an answer for right now is, how many of the three boosters was SpaceX able to land back on Earth? Well, the lift-off was glorious and the rocket made it through the maximum stress zone of the atmosphere without any hiccups. Once through, two of the Falcon 9 boosters that were on either side of the core booster of the Falcon Heavy separated and landed back to Earth, that too simultaneously. Yes, they touched down at SpaceX’s new concrete landing pads at Cape Canaveral. Note: The launching and landing of rocket boosters isn’t anything new for SpaceX as it has managed to do the same multiple time before. But, today’s launch was important from the point-of-view that it had to communicate with and land two such boosters simultaneously, that too quite close to one another. It’s an achievement in itself and bumps the number of successful landings to 23. As for the booster at the center, the landing of the same did not go as intended. It did detach from the upper stage, performed all the necessary actions to make its way back to Earth, but was not able to stick a perfect landing on the autonomous droneship sitting in the middle of the Atlantic Ocean. As confirmed by SpaceX’s founder and CEO Elon Musk, the center booster landed into the water and not on the droneship because only one of the three engines, necessary to stick the landing, ignited on the way back. This led the center core to hit the Atlantic Ocean waters at a speedy 300 miles/hour. Hence, the private space giant is successful in recovering just two boosters, when it wanted to bring all three safely to Earth. This sure is disappointing for SpaceX, but there can surely be hiccups in the demo flight of a newly constructed rocket. I’m thoroughly impressed and excited to see how this rocket is going to change SpaceX’s flight pattern and schedule. Otherwise, the launch went fairly smooth and we can now address the upper stage, which was next in line to separate and lose the protective fairings (that will also be recovered for reuse) to get ready for its Earth-Mars journey. But, before the upper stage separates and the payload could leave for its lengthy 6-month long trip to Mars, the rocket will be coasting the Earth for 6 hours. This period of still going on at the moment and is a move from SpaceX to demonstrate to the U.S Air Force a rather tricky orbital maneuver. This is an important part of the mission as the engines will need to ignite after this orbital maneuver, else the payload will be stuck in the Earth’s orbit. It will eventually fall back to Earth but burn to pieces on re-entry. And we wouldn’t want that because the payload is quite precious. Before performing the trans-Mars injection burn, where the upper stage will finally detach from the payload to send it off on a journey through space. The payload, if you’re curious, is Musk’s red-coloredTesla Roadster with a dummy astronaut behind the wheel and it has donned the prototype SpaceX space suit. But, the fun doesn’t end there. This was Musk’s plan to make the demo flight a lot more interesting so that many people would take notice of the launch of a rocket from Earth. Earlier, we used to send up only a block of concrete, now where’s the fun in that? Now, this successful launch means that the Falcon Heavy is officially in business. SpaceX’s phone will now start ringing non-stop with calls from private and government agencies, as they’ll now be looking to send larger payloads out into Orbit. And this launch just sets the precedence for what’s to come over the next five odd years, the BFR. So, who’s excited to see more simultaneous landings of the Falcon Heavy? And did you all watch the demo flight live stream last night? Do let us know in the comments below.